The 2012 nissan nv2500 hd cargo electric vehicle qualifies for a federal tax credit of up to $7,500, effectively reducing the net base price. For 2012, Nissan is jumping into the commercial van market with its full-size “made in America” NV cargo and passenger vans. Until now, customers looking for a full-size work or passenger van could only turn to Ford, Chevy, or Mercedes-Benz. Nissan sensed an opening for an all-new, affordable van designed to accommodate the special needs of customers in a way no previous domestic van can match. Available in cargo van form as the NV1500, 2500 HD and 3500 HD – the latter two offering a towering extended roof option – the NV poses a serious threat to the outdated Ford E-Series and Chevy Express. There is also an NV3500 HD passenger van offering a number of unique features regarding passenger comfort and safety. The 2012 Nissan NV holds wide appeal to anyone that needs to move a lot of cargo or people, but must also mind the budget. V6 models are priced right, and the vast capability of the cargo van’s configurable cargo bay is staggering. The Nissan NV van for 2012 isn’t quite as handsome as its Ford and Chevy rivals (if a van can be considered handsome), and it doesn’t have their long repair and reliability history either. If you’re looking for diesel power or all-wheel drive, you’ll have to look elsewhere. New for 2012 is the NV3500 HD passenger van series. Built from the same platform as the NV cargo van, the passenger version offers configurable seating for 12 with integrated seatbelts, and side-curtain airbag protection for all rows. Standard on the 2012 Nissan NV1500, NV2500 HD cargo and the NV3500 HD passenger is a 4.0-liter V6 engine that is surprisingly capable. Even with a full crew on board, the engine pulls strongly, although it does labor a bit once up to speed. The big 5.6-liter V8 is probably preferable for those who care more about utilizing the NV’s 3,925-pound maximum payload or its 9,500-pound tow rating, and less about fuel economy. Ride and handling are about what one might expect from a massive rolling brick, but we must say the NV’s suspension does a good job stabilizing the big van in the turns, and its 45.2-foot turning diameter, while not tiny, is a few feet better than the Ford E-Series or Chevy Express. As for acceleration, the NV can easily keep up with its rivals from Ford and Chevy, but it will just as easily outrun (and overtake) the slower, but more fuel efficient, turbodiesel Mercedes-Benz Sprinter. For anyone who's had to fight past the web of ceiling-mounted seat belts to reach your shuttle’s rear most seats, the NV’s clever solution of integrating the belts into each seat will be a welcome sight. Available on the cargo vans, numerous pre-drilled and reinforced anchoring positions allow customizers to add all manner of shelving, tool racks and accessories without damaging the cargo bay’s steel walls. Both the cargo and passenger variants of the 2012 Nissan NV go out of their way to please the customer. On the NV3500 HD passenger vans, there are numerous storage and cup holders, as well as overhead lighting, heating ducts in the floor, and 65/35 split/removable rear seats. The 65/35 divide allows for more flexible cargo and seating space. In the cargo van, Nissan created a cargo bay with an available 120-volt 3-prong outlet, a level load floor and flat-top wheel-well housing to aid stacking, and multiple pre-drilled anchoring points in the floor, walls and roof. The most noticeable exterior feature on the Nissan’s 2012 NV2500 HD and NV3500 HD van is the available extended roof. This option increases interior ceiling height by 21 inches, allowing a 6-foot person to stand upright in the cargo hold. Access via the sliding side door is easy, thanks to its 40-inch-wide opening, while the split rear doors can swing open to the standard 90 degrees, or be moved back a full 243 degrees, held in place by a magnetic stopper. Nissan specifically made the NV’s lower rear opening wide and flat enough to accommodate a forklift loading pallets. Standard equipment for the 2012 Nissan NV includes 17-inch wheels, tilt steering wheel, folding outside mirrors, rear step bumper, water-repellant seat fabric, AM/FM/CD stereo with auxiliary audio input jack, and air conditioning. The passenger van adds power outside mirrors, privacy glass, 12-passenger seating, and an under-seat pull out storage tray. Standard 2012 NV safety equipment: electronic traction and stability control, front airbags and, on the passenger van, front side-impact and ceiling mounted full-length side curtain airbags. Options for the NV cargo van include front side and side-curtain airbags, power windows, power driver’s seat, cruise control, remote keyless entry, two 120-volt outlets, 8-way power driver’s seat, rear door glass, in-dash navigation radio with USB port, Bluetooth hands free phone connectivity, XM satellite radio, rear sonar system, in-mirror rearview monitor, and Nissan’s Fleet Telematics tracking and recovery system. The NV3500 HD passenger offers such premium items as chrome clad wheels, power heated extendable tow mirrors, front and rear sonar system, dual-zone front air conditioning, heated front seats, leather appointed seating, 6-speaker audio, and Nissan’s Vehicle Immobilizer system. 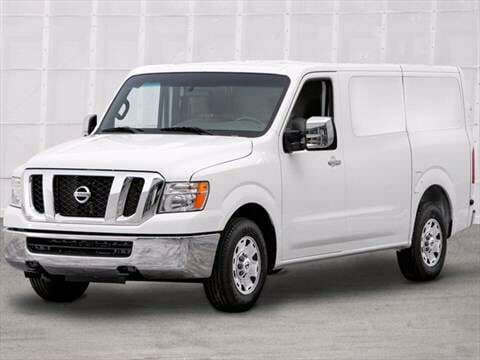 The 2012 Nissan NV van comes standard with a 261-horsepower V6 engine and 5-speed automatic transmission. This engine easily out-powers the V6 options from Ford and Chevy, and nearly matches those vans' small V8 engines. Still, for the really big jobs you’ll want the 5.6-liter V8, which is standard on the NV3500 HD cargo and available on all but the NV1500 series. Although not as torque-laden as the diesel engines from Ford and Chevy, this V8 is impressive in abilities to tow and haul, and its operation is free from harsh noise and unwanted vibration. Knowing that the 2012 Nissan NV vans would have to be priced to compete, Nissan has done a good job matching the vans from Ford and Chevy at each level. The manufacturer’s suggested retail price (MSRP) for the entry-level NV1500 S starts around $25,000 and moves up to around $30,000 for the NV2500 HD with the high roof. A nicely equipped NV3500 HD SV runs about $35,000. The NV3500 HD S passenger van starts around $32,000 and can reach as high as $42,000 with most options added. Be sure to check out KBB's Fair Purchase Price to see what others in your area are paying for their NV vans. As far as resale goes, we expect the Nissan vans to hold their value as well or better than the vans from Ford and Chevy.